Race Inspired: A sports bike in its purest form. Reduced to the essentials. Agile, fast, suitable for A2 driving licence and extremely sporty. Whether you are on country roads or the racetrack, the Moto3 genes are perceptible in every manoeuvre and convey a pure race feeling. The handling - simply spectacular. The performance - incredible. The power - thrilling. Phenomenal power: The KTM RC 390 engine not only delivers bountiful torque and punchy acceleration, but also good manners in everyday use, all with outstanding fuel economy. This lightweight, compact engine really packs a punch and with 32 kW (44 hp) it's the sportiest option out there for A2 riders. Thanks to the ingenious intake design and the meticulous fuel injection system, the KTM RC 390 is ready to leave the rest of the city traffic behind at the twist of a wrist. Exactly like they did in the RC8 R, the four valves in the cylinder head of the KTM RC 390 are actuated by two overhead camshafts and ultra-hard, carbon coated cam followers, providing reliability and longevity despite the engine's high power output. Not only does the slipper clutch open when the engine back-torque becomes too high, it also assists when you open the throttle. The former prevents rear wheel chatter when braking sharply or decelerating - and gives the wheel just that bit of braking for a controlled rear wheel slide. The latter allows the clutch to be pulled and controlled with just one trigger-happy finger - saving you energy and offering greater control - just like the pros. It's the guarantee of a smooth throttle response, more than simply the absence of a throttle cable. 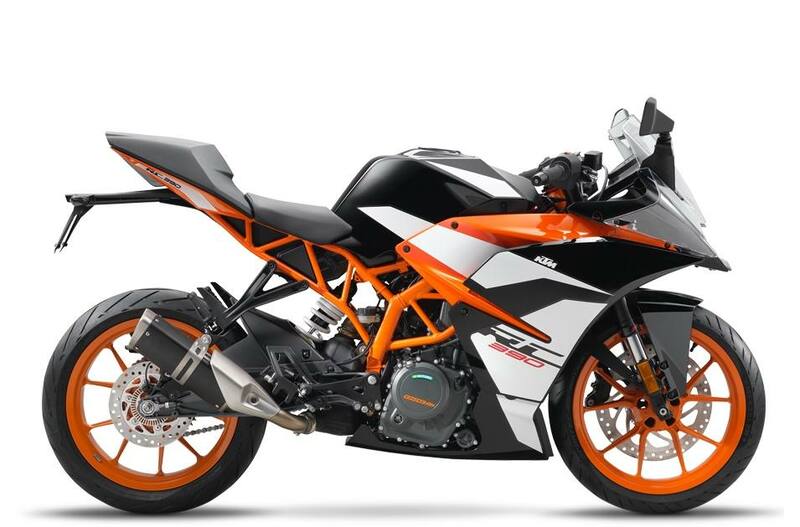 The KTM RC 390's ride by wire ensures perfect delivery of the readily available and plentiful torque. It also electronically translates the throttle commands of the rider into throttle valve positions, perfectly suited to the riding conditions, making this the perfect crossover bike for both track and road riding. Race-inspired system: The compact, three-chamber silencer is positioned close to the bike's overall center of gravity. This helps keep the motorcycle centrally balanced and easy to maneuver in the tight and twisty urban streets. The orange painted frame of the RC 390 has been engineered to be one of the best performing chassis in the segment. It's been built to reward riders with impressive agility, sporty feedback, comfortable ergonomics and dynamic handling. The increase of the steering head angle to 66.5 degrees resulted in a shorter trail, shorter wheelbase and increased ground clearance. All these modifications release the racer in the RC and guarantee quick, responsive and playful handling. 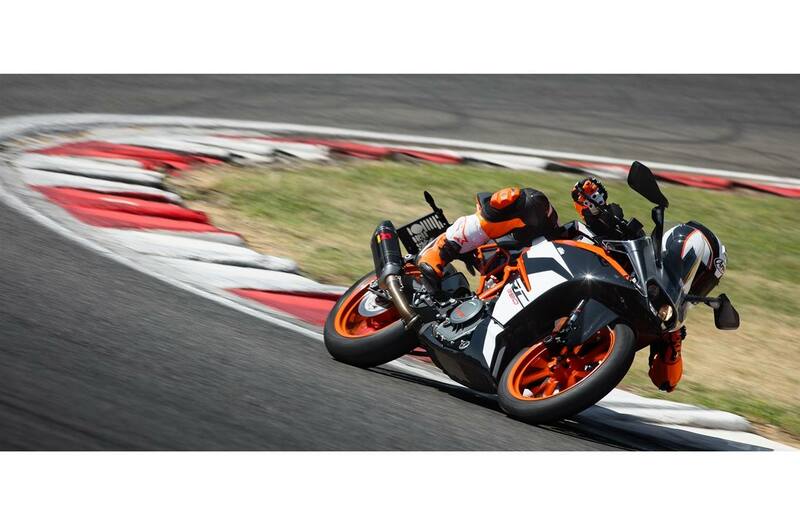 Ultimate braking: In cooperation with BREMBO, KTM developed a high-tech braking system that works in perfect harmony with the state-of-the-art ABS, allowing riders to always be in full control of their KTM RC 390. With a four piston radially bolted caliper and a huge 320 mm brake disc on the front, paired with a single piston floating caliper and a 230 mm disc on the rear, the RC 390 delivers exceptional pro-level braking, no matter how hard you're riding. Ergonomics meets style: The KTM RC 390 features a sleek, steel fuel tank with a 10 liter capacity (including a 1.5 liter reserve tank). The tank has been developed to perfectly match the supersport style of the KTM RC 390 with smooth rider ergonomics. Thanks to the economic engine, the KTM RC 390 offers considerable range with this tank, even when riding in full sport mode all day long. Racing profile bars: The clip-on bars and strategically positioned switches contribute greatly to the bike's sporty and aggressive riding position, whilst also enhancing control for perfect lines through any corner. Supersport ergonomics: The two-part seat offers first class, supersport ergonomics with perfect support for both rider and pillion. A seat height of 820 mm enables riders to have a secure position, whilst also being high enough for circuit-style riding. The Pillion seat has been integrated into the bodywork so as not to compromise the supersport look of the KTM RC 390, whilst also ensuring excellent comfort for the passenger. Advanced aerodynamic protection. : The advanced design of the KTM RC 390's windshield works with the aerodynamic optimization of the front end to ensure ultimate wind protection for riders who like to open it up on the open road. Race-ready footpegs: Crafted from high-grade, CNC-machined aircraft aluminum, these lightweight yet super-strong footpegs offer premium purchase for your feet when you need it most. The pegs are fully customizable with three positions available to accommodate for different rider shapes and riding styles. True supersport headlight: The powerful twin headlight provides superb visibility in low-light or dark conditions and perfectly matches the modern, supersport race look of the KTM RC 390. Integrated blinkers have been subtly incorporated into the mirror structure to ensure that the KTM RC 390 not only looks super-sporty, but also benefits from perfect aerodynamics for a faster, more efficient ride. An aerodynamic thin tail that fits perfectly into the pure racing look, combined with the integrated number plate holder, rounds off this high performance KTM. ABS is standard equipment on the KTM RC 390. Use it to your advantage to enhance safety or switch it off if you're feeling READY TO RACE. Whether cruising the streets or racing the tarmac, intensify your RC 390 to suit your personal preferences with KTM's wide range of accessories for KTM motorcycles. All KTM PowerParts are developed specifically for their chosen machine, guaranteeing KTM riders only get parts that perfectly complement their ride and provide that important ‘factory fit' straight from the dealer.